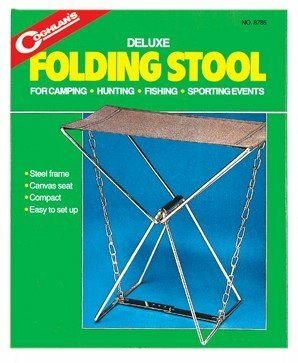 Rest easy at the campsite or cabin with this deluxe folding stool from Coghlan's, which features double-stitched canvas seat on a brass-finished, rust-resistant steel frame. Easy to set up, it's great for camping, hunting, fishing, sporting events, or any outside event. Coghlan's makes the outdoors more comfortable and enjoyable with over 450 accessories for camping, hiking, fishing, and RVing -- from cooking gear to first aid kits, insect netting, firestarters, tent repair, and more.